Sometimes it pays to give yourself a break. Recently I was taking on quite a lot, some might argue a little too much. But a flurry of custom orders and making stock for my Etsy shop caused me to go into ‘knitting overload‘. I don’t normally like to double up on projects, but recently it seems that’s all I’ve been doing. I can’t complain, because it’s exactly what I love doing, but even knitters need a break from knitting sometimes! I’m my own worst enemy however, because after just a few short days of ‘not knitting‘, I was itching to pick up the needles again! And from that little mini-break came this beauty of a pattern. After several garments and accessories, this flat knitted, easy-going baby blanket was a welcome change. Before I say anything else, this 100% cotton baby blanket can be washed at 40°C. I say this first and foremost, because I know it’s important as a parent. If this blanket is going anywhere near a baby, it’s gonna get messy! Being knitted in cotton makes for a light, flexible texture, but it’s also lovely and warm (perfect for a little one). Whether they’re catching some Z’s on the sofa or snuggled tightly into their pushchair, this blanket will be perfect to tuck them up with! The Knot Stitch Baby Blanket is constructed using a repeating textured ‘knot’ pattern, complete with a non-rolling edged border. You can easily make this blanket as big or small as you need by increasing the number of ‘knot stitch’ repeats within the edging. So without any further delay, here’s the pattern! Knot – Purl the next 3 stitches together, do not drop them from the needle. Knit the same 3 stitches together, then purl the same 3 stitches together. Drop the stitches from the left needle. This pattern is knitted flat. Begin by casting on a multiple of 6 + 5 stitches for your knot stitch repeating pattern, then add your preferred number of stitches for a non-rolling border edge like garter stitch. For example I cast on 137 for the knot stitch repeat section, plus 10 extra stitches for the garter stitch border (five stitches either side of the knot stitch pattern). So a total of 147 stitches for me. But this is totally up to you, as long as you follow the repeating pattern below, you can add whatever border you like to whatever size you like. I knitted all stitches back and forth in knit stitch for 6 rows to begin with, to create a decent sized non-rolling border. Then started with the below repeating pattern, making sure to always knit the first and last 5 stitches to maintain the garter stitch border up the sides. Then, when I’d knitted enough knot stitch repeats to create a blanket the size I wanted, I finished off by knitting another 6 rows of garter stitch. LOVE this! And it’s perfect for what I want to do. LOVE this pattern! It’s so simple and perfect! Quick question, did you go with the dark grey or light grey Drops Paris? Also, how many skeins did this end up needing with the CO you used? Thanks, really glad you like it. This pattern is knitted flat, I only really used 5mm circulars because of the size I wanted the blanket to be, the extra slack between the needles really helps to hold all of the stitches nicely. You can definitely knit these on straight needles, but I’d recommend using long straight needles – such as 30-35cm in length. Hope that helps, and let me know how you get on with the pattern! hi Beth they we’re 5mm but how many inch with your circular needle a 24 inches or less ? I used a 24 inch set of 5mm circulars. And I completely agree with what Kelly is saying in terms of needing a bit of length to comfortably hold the stitches, especially if you choose to work with cotton. It’s perfectly manageable on a short circular, though I agree with Beth that it’s doable on straights, you just need long ones. If you’re using a cotton yarn, it’s not super scrunchy on the needles so you’ll need the space. That said, the pattern knits up beautifully, the drops Paris yarn is soft and pretty, and overall a really great knit. Enjoy! I really hope this helps show you how to do the repeating pattern, then you just need to add a garter stitch border, as my pattern describes. Hello! Really nice blanket! may I ask the measurement of finished garment ? Thanx! 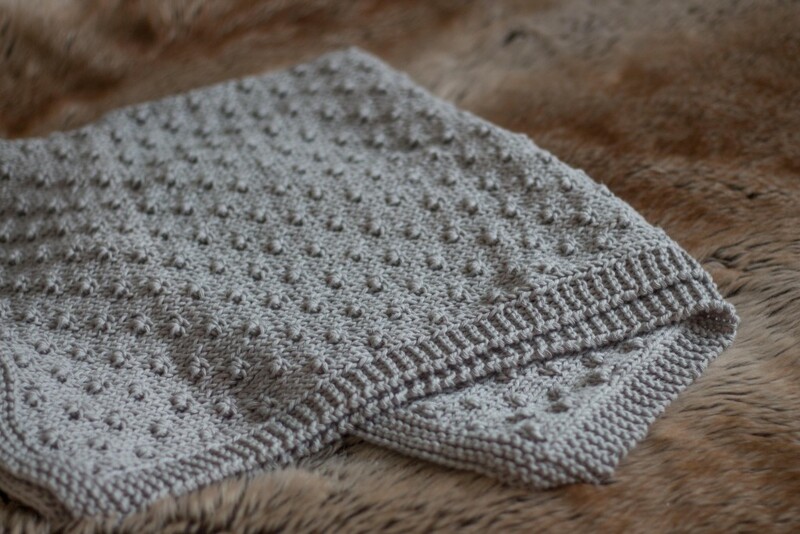 This is truly a beautiful baby blanket, I will have to knit one for each of my grandchildren. Some are older but I thought I could easily double or triple the pattern. Thank you so much! It is a really easy pattern to multiply in size. I’m trying to find the time to make a bedthrow. When you get round to making yours, let me know – I’d love to see your finished results! i forgot to make the 5 garter stitch at each end of the rows . and it’s for a baby shower gift . I’ve lost count of how many times I’ve done this with projects! Not to worry, as you could just pick up stitches along each edge and knit a garter stitch border for 5 or 6 rows. Then cast off in knit stitch. The stitches will just run vertically instead of horizontally, but it would have the same effect as having worked it along with the blanket. I hope that helps. you really saved my life …. what if i had cast off already . Do you remember what the finished size was of this blanket? Just finished this lovely little blanket and have a bit of the yarn left over. Was hoping to put together a very small sample for my baby grand daughter to have when the larger one is in the laundry. Sorry but I cannot for the life of me figure out how to reduce this to very small. Thank you for the pattern. It was so much fun! Hi, I’d like to make this blanket but wondering if you could clarify the pattern please? 137 is not a multiple of 6 so the numbers don’t work out. Okay now I understand thanks so much for the reply. Hi! what CO method do you recommend? Thanks! Hi! I would use a standard long tail cast on, but German cast on would work well too! Hi there, really love this blanket. I have some DK ( 8ply) weight wool and size 4 mm needles. Do you think it would work ? Thank you. I’m afraid I’m lost on row 3. Should it not read “knit 3”? Hi Kimberly, no to worry! Sorry, it’s not clear. You use three of those last four stitches to make your knot (by purling, knitting and purling again into those three stitches held together) then you should have one stitch left to knit. Hi Beth. I just finished making your awesome blanket using koigu doubled on a size 7 circular needle. It came out amazing! This is my new favorite baby blanket. I was wondering if you ever wrote a pattern for a matching hat? I like to give away the blankets as gifts and I’d love to include a little hat. Love the pattern,but it not clear that when I cast 137 +10 (5 on each side) will give me what size blanket knit on 5mm needles. Would appreciate your prompt reply. This is a lovely pattern! I’m trying to find a baby blanket pattern where the 2 sides of the blanket look the same. Could you tell me if that is true with this pattern? Thanks! Hi Beth! Thank you for this wonderful pattern – I’m so excited as a new knitter to try it (only made twisted cowls from ravelry previously). I have done the non-rolling border garter stitch, ready to start in on the knit/purl/knot pattern. 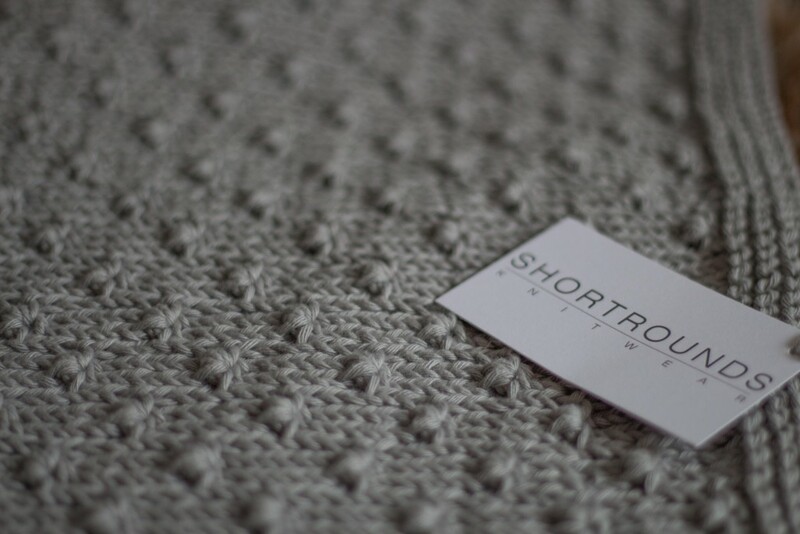 Im having a bit of trouble starting on the knit stitch row, every video i watch, says the knit stitch is the exact same knit as the garter stitch, but i see in your photos, your blanket inside stitch looks distinctly different than the border. Would you happen to have any clue what I am missing? Thank you so much, I look forward to connecting, and learning all your beautiful experienced knitting wisdom.